Built almost 30 years ago in the late 1970's to early 1980's by Taylor Woodrow Group, adjacent to - Tower Bridge, Tower of London, the Tower Hotel and backing onto St Katherine's Dock, this is a very long building. Somewhat unusual, it had a run of MTHW rather than LTHW pipework almost the whole length in the basement. TW's own "in house" structural and M&E design were involved and they asked Supaflex to assist on the expansion and guide scheme for the project. It was decided to site a pair of 150mm axial bellows in the MTHW F&R with a pair of smaller articulated bellows at one end for the risers. The structural engineers didn't want any fixings made into the old dock wall and all steelwork supports were mounted floor to underside of slab. Metallic bellows were used as pump flexibles on the MTHW pumps and although it was considered as a marginal need for axial bellows in all the heating risers it was decided to include them. This is an example of a very well installed installation for bellows. The 150mm axial bellows were fitted with two heavy duty reinforced PTFE slide guides each side of the bellows. 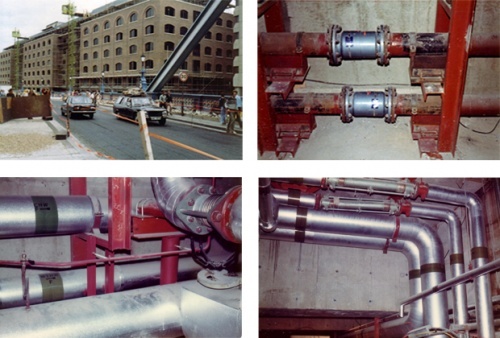 The whole run of pipework was supported on RPTFE skids for low friction. Supaflex recommend this to the design team at TW and their own M&E contracting division installed it.